Enough is enough! In all honesty, I thought twice about writing the Battling post the other night, wondering if it was wallowing a bit too much in self pity. But then it is a record of our REAL life, the good and the bad. Life can't always be roses. We wouldn't be honest if we said it was, never letting anyone think we ever had bad days. That said, let's move on. We can always choose to celebrate the season we're in. Regardless of whether our limbs ache and our heads feel fuzzy, we can still have fun. Yesterday, June 25, was Midwinter Christmas Day - exactly half way to Christmas. So today we celebrated it, in style. 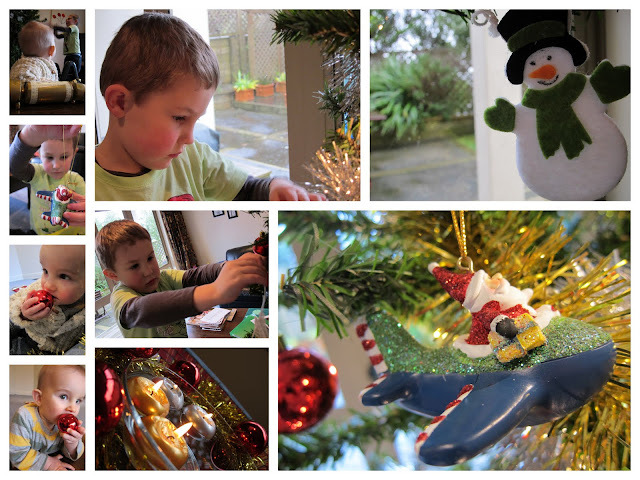 We put up the Christmas tree. We decorated it and sang along to Christmas carols. Mylo was entranced by red baubles and tinsel. Noah loved being able to reach even higher on the tree than he could at Christmas, although still needing Daddy's help to put the angel at the very top. We read all the Christmas stories we could find, including Mr Men's Mr Christmas, and Slinky Malinki's Christmas Crackers (he's one of Hairy McLary's friends). Our celebration wouldn't have been complete without a little added creativity. A floating centrepiece was created which took pride of place on our festive table, with mini 3-D Christmas trees adding a splash of greenery. From early afternoon, the house was filled with the gorgeous smell of our mid-winter Christmas roast chicken cooking in the slow cooker. It was a long wait till 5pm but oh so worth it! 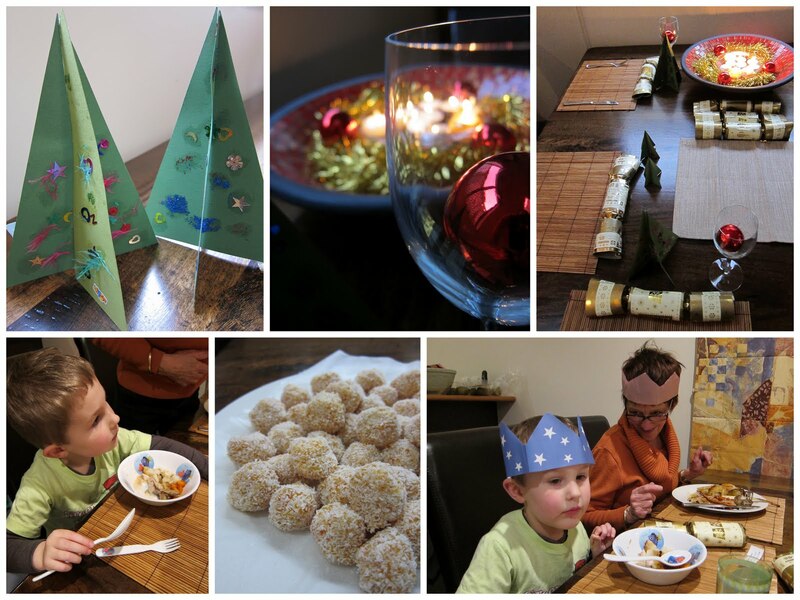 For some extra festive fare, Noah and I made Coconut & Apricot Truffles. I thought they would be quick and easy. Not so much. Easy to mix, just very time consuming rolling each one in coconut. Not helped by having discovered at the last minute we only had a limited amount of coconut. Rationing was required, which meant rolling each one very carefully. Pretty moorish though. Chop apricots in quarters, then put in food processor to get finer. Put in a mixing bowl. Add brown sugar, lemon/orange rind, coconut and condensed milk. Mix well. In a separate bowl, put enough coconut in that you can roll the mixture in truffle size balls. Put in fridge to set, and keep in fridge. Baba arrived at 4pm and we all sat down to our feast at 5pm, complete with Christmas crackers and festive hats. Did the roast chicken and bountiful vege taste sweeter than any other roast we've had? You bet. And as far as our Winter To-Do List goes this year, our Midwinter Christmas Celebration gets a big tick! Our favourite tune of the day was 'I Wish It Could Be Christmas Every Day'. Well today, for us it was! Fabulous! We have the fairy lights up here too - what with Charlotte's Birthday party - and I think a bit of mid-winter cheer is essential feel good medicine!